Reviews of Nucis Leathers’ Classic and Cork straps. This is a review of Nucis Leather’s Classic Leather strap and Cork Leather strap. FULL DISCLOSURE: Shortly after seeing these straps show up online Fernando from Nucis Leather emailed me to ask if I’d be interested in reviewing one of their straps. Far be it from me to turn down the opportunity to try out camera accessories, I gladly accepted. What follows is an honest review of what I received. It is also worth noting that I’ve avoided reading other reviews before having written my own, as is my usual approach to reviews. Since switching over to Fuji, I’ve been a wrist strap1 user on casual outings when having my right wrist mildly encumbered isn’t a problem, or I have my Billingham slung over my shoulder. When Nucis Leather sent a pair of their straps over, I decided to give the neck/shoulder strap strategy another go. Long story short, I’ve converted. Photos have a tendency to slip past uncaptured when the removal of ones camera for a bag is too much trouble. When I have my camera on a neckstrap, it’s as good as in my hand much of the time, and I shoot more. With that preamble out of the way, let’s get to some quick reviews. 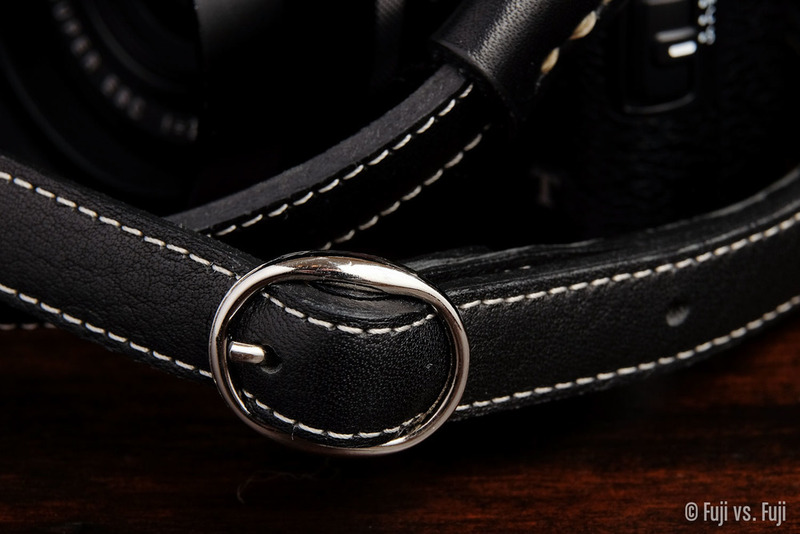 The black variant of the Nucis Leather Classic might be2 the best strap for black Fuji cameras. The strap that comes with Fuji cameras isn’t bad, it’s quite good in fact. It’s crazy light, fairly comfortable, and the branding isn’t too obnoxious. Still, you can tell it’s the strap that comes in the box. The Nucis Leather Classic is soft, supple leather with white stitching that matches the white engraved markings of black Fuji cameras perfectly. The strap is nicely adjustable by way of a handsome buckle, however I may take mine to my local shoe repair to have one more hole punched in the strap to make it even shorter. I’ll also note that when I first slid the strap through the buckle to fasten it, the buckle “spike” poked out awkwardly. It turns out this was simply because the leather was new, and still quite stiff. As you can see in the photo above, it has settled into place nicely. The bottom line is, I love this strap, and the biggest problem I’m going to have with it is keeping it off my wife’s camera. For a significantly more unique strap material, you could opt for the Cork version of Nucis’ straps. The cork has a very different feel to it. Almost summery, if that makes sense. It’s the sort of strap that won’t be as hot next to your body. The colour is more of a contrasting match to my preferred black Fuji cameras, but it’s a nice match nonetheless. Available in two lengths only, the cork strap isn’t the most customizable option. Because of this, I imagine I’ll find myself using the Nucis Cork as more of a sling vs. a strap. I can appreciate that punching holes in the cork would seriously compromise its durability, strictly due to the material, and stitching around each hole would be tough, if not impossible to do without looking weird. It doesn’t hurt that cork is eco-friendly to boot. You’d be hard-pressed to find a stitch that’s out of place, and the fastenings feel very solid. I have zero concern about my camera taking a tumble. The inside of the cork strap is luxurious. This will be my go-to strap during the hot, sunny summer months. These are some quality straps. The materials, fit and finish are absolutely exquisite. If you’re looking for a minimalist, understated, classic alternative to the strap included with your camera, Nucis Leather straps are worth a look. A lot of other straps available these days have a decidedly more hipster vibe about them. Nucis’, in my opinion are timeless. My only regret is I can’t post an affiliate link. They aren’t the least expensive straps on the market, but of the ones I’ve tried, Nucis are a cut above. If I were a buyer, I’d be tempted to pair the X100T with the black and red “Good Vibes” strap. I’d consider the brown and orange for the silver X-E2, or graphite X-T1, both of which have orange accents.